A recent report says only 1 out of 10 Americans eat enough fruits and veggies. Fruits and vegetables are high in vitamins, minerals and fiber and they are low in calories. There are many studies that prove eating more fruits and vegetables help increase our health and also help control our weight and blood pressure. It also lowers the chances of developing cardiovascular disease. So it important we make eating veggies and fruits a daily ritual! The important thing to remember with veggies is eating them raw is always beneficial. When you cook vegetables, try to not overcook and look for recipes that are heart healthy. For years I ate veggies the southern way which meant lots of butter or deep fried. Today I’m thankfully more conscientious about what foods I should and shouldn’t eat. Here’s a nice snack to consider. If you like Hummus here’s a very simple recipe that at first may seem bland but it grows on you. Drain the can of Chick Peas and rinse thoroughly. Place in a blender and puree. Transfer to a bowl and mix your fresh lemon juice and add a bit of ground pepper. Taste and decide if you’d like more lemon and pepper. Enjoy with fresh carrots or another veggie. * Choose a market that has fresh ahi tuna. Use cracked pepper or regular ground pepper. Add as much as you’d like. Remember you can always add more when cooked. Add a little salt. The key word here is little. Spray pan with pam and then add a tablespoon of grapeseed oil. Turn heat to medium high and allow pan to get hot. Place fish in pan for 1 minute and then turn for 1 minute on the other side.The idea is to sear the fish. Put out of your mind that you have to have the fish cooked well done. It’s not the case with fresh tuna and it will be quite tasty. However, if you’d like to cook your fish longer feel free. Your meal will still be wonderful and fresh. I use romaine lettuce already washed and bagged. Add veggies like carrots, squash, cucumber, tomatoes and if you’d like add a few sunflower seeds. The dressing is where we usually make the biggest mistake. Don’t use prepared dressing that is loaded with unhealthy fats and sugars. Instead develop your own vinaigrette dressing. I start with a little lemon juice followed by cracked pepper and cold pressed virgin olive oil and red wine vinegar or balsamic vinegar. Then I enjoy adding a bit of balsamic glaze just for a nice sweetness. Keep in mind that too much salt is not our friend so use salt sparingly. Again, feel free to use Mrs. Dash and other herbs like italian seasoning, oregano etc. Fresh basil is also a nice addition. Be creative! This is really simple. Put the salad in the middle of the plate and slice the fish in 1/4” widths and place on top of the salad. Garnish with fruit. Feel free to use the balsamic glaze to make a design on the plate. Have fun! So, how do you feel about oatmeal? Recently, when I posted a comment about Oatmeal on Facebook, some said it’s like eating mush or that it’s boring while others said they enjoy a bowl now and then. Now before you get ready to send me your grain free view… Yes, I am aware of the blogs and doctors who suggest eliminating all grains is healthy. Again, there are choices to be made and you must choose your own path. I’m also aware of those who cannot eat gluten. (For gluten free oatmeal check out Bob’s Red Mill and GF Harvest). There are also blogs and doctors who suggest eating a bowl of oats is nutritious and helpful in a balanced diet. Although I don’t depend on oatmeal for all my fiber (which can reduce the absorption of cholesterol into the blood stream) I have enjoyed it at least 4-5 times a week for more than a year. The Mayo Clinic and other heart centers across the country suggest 5-10 grams of soluble fiber a day decreases your total and LDL cholesterol. By eating 1 – 1 1/2 cups of cooked oatmeal you will consume 6 grams of fiber. If you add fruit as suggested in my recipe you’ll add another 4 grams. Do you have to eat oatmeal? No, but I’d say for some it has its benefits. I use McCann’s steel cut oatmeal. Steel cut oats are a little more al dente but if cooked longer will become softer. Also, I use a medium pot and a wooden spoon. A wooden spoon you say? Yes, I don’t like the sound of a metal spoon in the pot while I’m stirring. So if you want this to be a most pleasurable experience, please use a wooden spoon. Add 1/2 cup of oats and turn to medium heat stirring occasionally. After a couple minutes turn to medium low and cook for about 10-15 minutes. You may need to add a little water (i add unsweetened almond milk) toward the end to get the right consistency. You can also use mccann’s quick & easy steel cut oats which are ready in just 5 minutes. Add 1/2 crisp apple cut into bite size pieces about 1/2 way through the cooking time. You can also add 1/2 banana cut into small pieces. Or you may choose to wait and add the fruit at the end if you like. This is your choice. Mix up the fruit however you like. In fact, sometimes i add three different fruits. Be creative! Flaxseed has health benefits because of its high fiber and omega-3 fatty acids as well as phytochemicals called lignans. In fact one tablespoon of ground flaxseed contains 2 grams of polyunsaturated fatty acids and 2 grams of dietary fiber. It’s worth noting that flaxseed may also help lower total blood cholesterol and ldl which may help reduce the risk of heart disease. 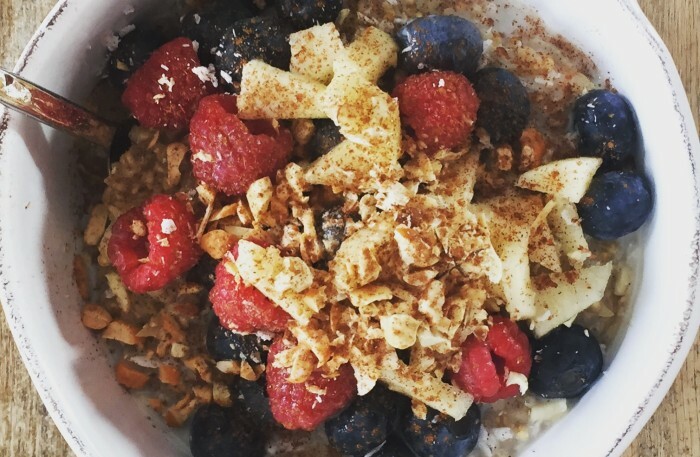 Once your oatmeal is ready to eat you may choose to add a bit of unsweetened almond milk. I also add a few chopped nuts. Use raw nuts like almonds, cashews, walnuts or pecans. Make sure there is no added salt. When i first started eating oatmeal i used a teaspoon of honey to sweeten. However, i now enjoy the way the fruit naturally sweetens the oatmeal. Enjoy: One Bite At A Time.